Mizuno Runbird Slide Sandal. 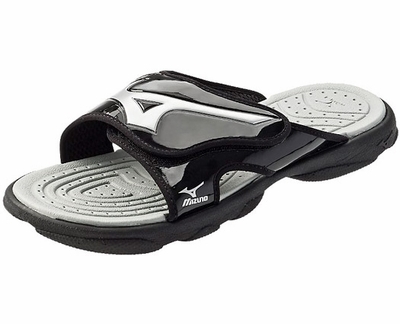 The Mizuno 6 Slide Sandal is the perfect lightweight & durable pre-game and/or after sport slide sandal, with adjustable velcro strap and cushioned EVA midsole. New to the Runbird 6 is a glossy finish to the Velcro band, and large Mizuno Runbird logo. � Variable Velcro Band for a custom fit. � Silver Contoured Orthopedic Footbed for comfort. � Polyurethane Outsole for comfort and durability. Great sandals to keep in a softball equipment bag for switching out of cleats.